‘ I am a drinker with a writing problem’…the words of one infamous McDaids patron, Brendan Behan, and if ever there was a quote to raise an ironic smile then this was it. 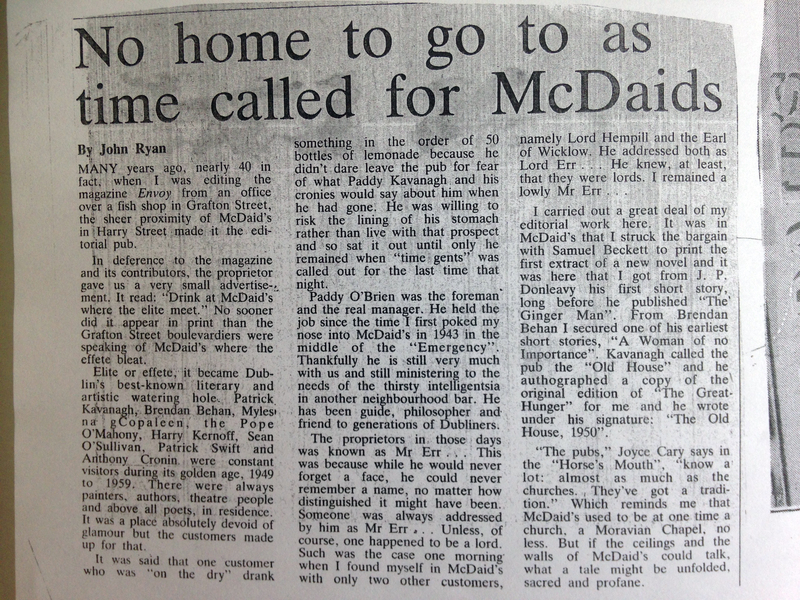 McDaids is now considered one of the most iconic Literary Pubs of Dublin not least thanks to Brendan, but it wasn’t always so. In fact McDaids only became established as a true haunt for literary types after John Ryan, editor of the now defunct, Envoy magazine, began to attract all manner of writers and journalists here back in the late 1930’s. The building that houses McDaids can be traced back to the late 18th century and is reputed to have housed the City Morgue. It took on it’s more ecclesiastical features when it was taken over by the Moravian Brothers some time later. They developed the practice of standing their corpses in a vertical position and it’s suggested this may be the reason for the very high ceilings in the pub. 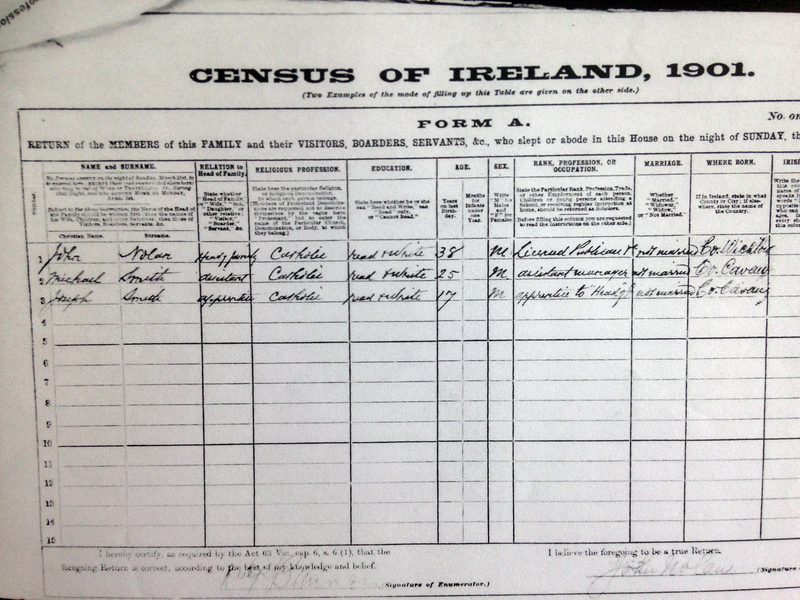 It went through a litany of owners including John Nolan who had the pub at the turn of the 20th Century and it was known as William Daly’s Bar before John McDaid purchased the pub in 1936. 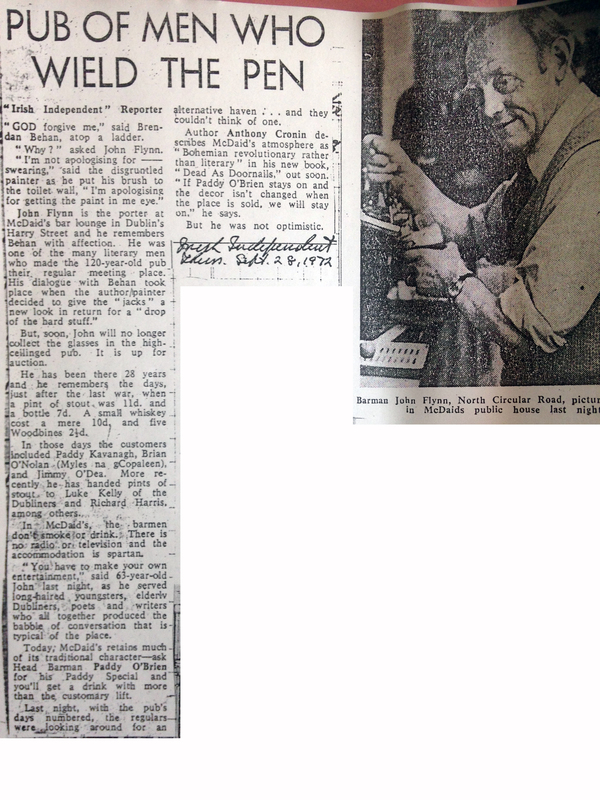 Paddy O’Brien, one of the most famous bartenders, not just in McDaids, but in the whole of Dublin, worked here from 1937 until 1972, and was quoted as saying that ‘Davy Byrnes was the one truly literary pub back then, McDaids in fact was nothing at all. It was a dreadful place, just an ordinary pub with snugs, stained glass partitions, spittoons and sawdust’ John Ryan was equally harsh in his assessment saying that McDaids was a dowdy little pub, the plainest possible but that was one of the things I liked. 90% of people were working class” Thanks to some well intentioned advice to the owner from Paddy, the interior was torn out, the place brightened up a bit and thanks to a little help from Mr Ryan, the rest as they say is history. Many literary greats have frequented here over the years but the 50’s and 60’s were the decades when the pub truly established it’s now famous reputation. Brendan Behan, Paddy Kavanagh, Brian O’Nolan, Austin Clarke, Anthony Cronin, J.P. Donleavy and Liam O’Flaherty are just a handful of the famous writers that have graced the floors, quenched their thirsts and sought their inspiration in McDaids over the years and some of their portraits adorn the walls and look down now, perhaps in judgement, of the rather more sedate clientele that drink here these days. Some notable patrons who have crossed the threshold in recent years include the then Secretary of State, Hilary Clinton and Russian Oligarch, Roman Abramovich. In the early 1980’s the bar was relocated from left as you walk in, to it’s now familiar position on the right. Whether that was to confuse patrons into not knowing whether they were coming or going, one can only summise. Whilst the walls may not be able to tell any stories from the bygone days, the latest generation of bartenders in McDaids are equally skilled in pouring pints of the black stuff and well versed in the history of this quite magnificent pub. So why not pop in, have a chat, a pint or two of Porter, and get a feel of what inspired those literary greats.